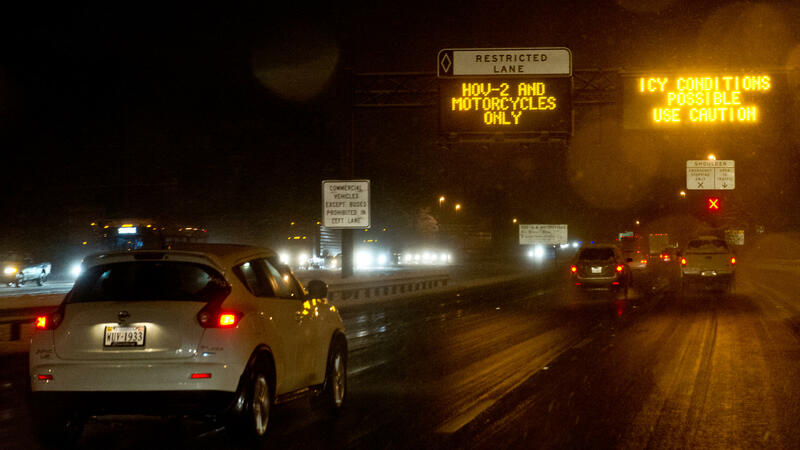 Signs warn drivers of icy road conditions on Interstate 66 in Fairfax County, Va., in March 2014. The state's Department of Transportation recently added rush hour tolls to the road, using dynamic pricing, which continuously adjusts the cost based on congestion. Then-Del. Bob Marshall, R-Prince William, holds a sign as he talks to the media at the Capitol in Richmond, Va., on Feb. 10, 2016, after the governor announced an agreement on an expansion plan for Interstate 66 in Northern Virginia. So Virginia's Department of Transportation is trying something controversial: ending free rides for hybrids, expanding the restricted hours and allowing solo drivers on for a price. And oh, what a high price it is. "Eleven dollars [to] Washington, D.C. $11." That's $11 to drive just 10 miles, so Hewton is relieved that for him today, it's free. "If we have two or more people, we don't have to pay. If you're driving by yourself, it will cost you that much." That's enough to make any driver spit out his coffee. "I think it's outrageous. It's actually an abuse of power, as far as I'm concerned," says Alan Bechara, who lives in suburban Chantilly, Va.
"Why do we need to pay $40 for a public road, to use a public road? We funded this road; we paid for it," he adds. "I'm a Virginia resident for 38 years. I can assure you my tax dollars funded this road." "You know, maybe $5, I mean, just something more reasonable," Jaber says. "But a daily commute of $40 plus is extraordinary; it's extreme." Transportation officials say that's actually the whole idea. "What the toll is saying is, 'We don't want you to use it.' 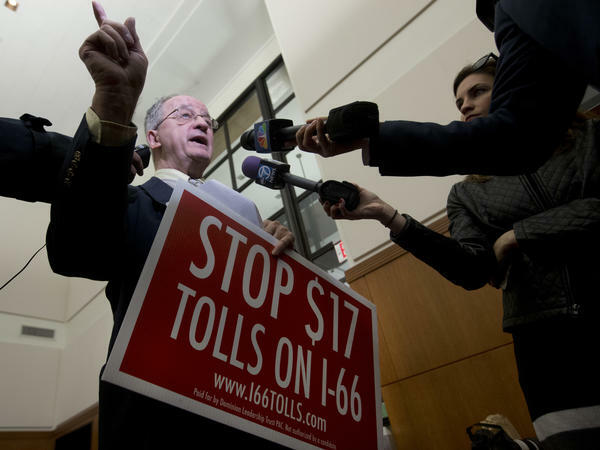 I personally wouldn't pay that toll," says Virginia Transportation Secretary Aubrey Layne. "We are definitely trying to change behavior because we have limited resources," Layne adds. "We don't have the money nor the political will to continue to build highways." "This is a choice. No one is forced to pay this toll. And as a matter of fact, if you put someone else in your car, you never have to pay anything." And because this wasn't even a legal option for solo drivers during rush hour before last week, Layne says there's been only a little spillover effect clogging other roads with drivers trying to avoid the high tolls, though some drivers complain about more congestion at entry points where commuters are trying to decide whether to get on and pay. While the peak prices are among the nation's highest tolls ever charged, some see them as a sign of things to come. "You definitely are going to see much more tolling both for general purposes, and you're going to see tolling like the price-managed lanes on I-66 to alleviate congestion," says Pat Jones, executive director of the International Bridge, Tunnel and Turnpike Association, which represents toll facility owners and operators. Jones says there are already 40 toll facilities in 11 states, including California, Texas and Washington, using dynamic pricing, and many more under consideration across the country. Most tollways with dynamic pricing don't have a cap or a maximum price, but they sometimes have a minimum price and averages. On Southern California's I-91, in Orange and Riverside counties, the tolls can reach as high as $25.05. "I think in fact we are underpaying; we've underpriced the highway system and evidence of that is the congestion that we see in our urban areas," Jones says. Jaber doesn't use I-66 and believes "it's a very unjust system. I think there are a lot of people ... that are not going to use it as a reflection of obviously cost and budgeting." Urd Milbury, who commutes to and from her job at the Norweigan Embassy, hasn't taken I-66 yet "and I probably won't because of the prices. It could be extremely expensive at times, which is probably exactly when I want to go to work." "You've got the cost of your car, you've got the gas, you've got two rounds of tolls," she says. "It's not sustainable." Meghan Jackson says she and her family "dance around" using the I-66 tollway, taking alternative routes or the Metro subway into the city. "I'm not sure if this fix will really reduce traffic in any way and I'm not really sure if its really of service to those of us living in Northern Virginia who have to get into the city." How much would you be willing to pay to avoid bad traffic on your commute - $10, $20, $40? Forty dollars is what a tollway in the Virginia suburbs of Washington, D.C., charged for a short time last week. Not surprisingly, people were outraged. But transportation officials say the high-price toll is less about money and more about changing commuter behavior and reducing congestion. NPR's David Schaper has the story. DAVID SCHAPER, BYLINE: The 10-mile stretch of Interstate 66 from the northern Virginia suburbs into the District of Columbia is like no other road in the country. It was built in the early 1980s to be carpool and buses only during rush hour. Over the years, officials have opened it up to hybrids and a few other exemptions. And in recent years, scofflaw single drivers violating the HOV-only law helped choke the road with gridlock. So Virginia's Department of Transportation is trying something controversial - ending free rides for hybrids, expanding the restricted hours and allowing solo drivers on for a price. And oh, what a high price it is. ALFRED HEWTON: Eleven dollars for Washington, D.C. - it's $11. SCHAPER: Uber driver Alfred Hewton is merging I-66 from the Leesburg Pike in Falls Church, and he is relieved that today he doesn't have to pay. HEWTON: Well, if we have two or more people, we don't pay. If you're driving by yourself, then it will cost you that much. SCHAPER: Actually it could cost quite a bit more for solo commuters. With dynamic pricing, the cost varies based on demand and traffic flow. Last Monday, that toll topped $34 for a short period of time and, on Tuesday, $40, enough to make any driver spit out their coffee. ALAN BECHARA: I think it's outrageous. It's actually abuse of power as far as I'm concerned. SCHAPER: Alan Bechara lives in suburban Chantilly, Va., and is picking up a caffeinated drink at a Starbucks in Falls Church. As a Virginia taxpayer for 38 years, he argues he's already paid for the highway. BECHARA: Why do we need to pay $40 for a public road - to use a public road? We funded this road. We paid for it. SCHAPER: But commuter Mary Jaber says she understands the need for a modest toll - modest. MARY JABER: You know, maybe $5 - I mean, just something more reasonable. But a daily commute of $40-plus is extraordinary. It's extreme. SCHAPER: But transportation officials say that's actually the whole idea. AUBREY LAYNE: What the toll is saying is, we don't want you to use it. I personally wouldn't pay that toll. LAYNE: We are definitely trying to change behavior because we have limited resources. They have consequences. SCHAPER: Layne says planners cannot build their way out of the congestion problem. By opening up the I-66 carpool lanes to solo drivers for a high price, they hope to convince more people to carpool, to take public transportation or to commute during off-peak hours. LAYNE: This is a choice. No one is forced to pay this toll. And as matter of fact, if you put somebody else in your car, you never have to pay anything. SCHAPER: And because this wasn't even a legal option for solo drivers before last week, Layne says there's only been a little spillover effect clogging other roads with drivers trying to avoid the high tolls, though some drivers complain about more congestion at entry points where commuters are trying to decide whether or not to get on and pay. While the peak prices are among the nation's highest tolls, some see them as a sign of things to come. PAT JONES: You definitely are going to see much more tolling. SCHAPER: Pat Jones heads the International Bridge, Tunnel and Turnpike Association. JONES: I think in fact we are underpaying. We've underpriced the highway system. SCHAPER: There are already 40 toll facilities in 11 states using dynamic pricing. With very little new transportation funding likely from Washington anytime soon, commuters trying to avoid traffic jams may need to keep one hand on the wheel and the other on their wallet. David Schaper, NPR News. Transcript provided by NPR, Copyright NPR.